Manufacturing employment last year posted declines in 28 states, including a sharp drop in Wisconsin, where the factory sector is the historic backbone of the state economy. Shown in green is the Current Employment Statistics (CES) survey, also known as the establishment or payroll survey. It is calculated from a sample of employers and usually reported late in the following month. Shown in purple is the Quarterly Census of Employment and Wages (QCEW). The BLS describes it as being used for benchmarking the CES. At the end of every quarter employers are required to submit a report that is used to calculate their unemployment insurance payment. It is not seasonally adjusted, which accounts for the repeated peaks and valleys in the graph above. Thus any comparison is meaningful only if a month is compared to the same month in a previous year. There is a delay of several months before it is reported. The report for the first quarter of 2017 will come out in late July. 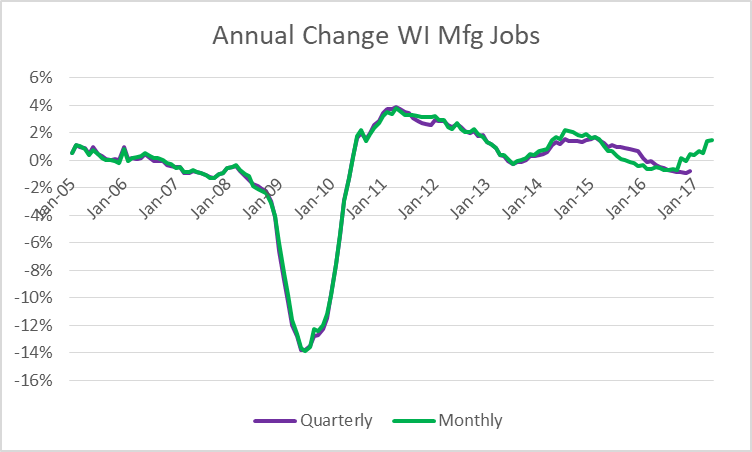 The next graph shows the annual change in Wisconsin manufacturing jobs as measured by both the monthly survey and the quarterly adjustment. 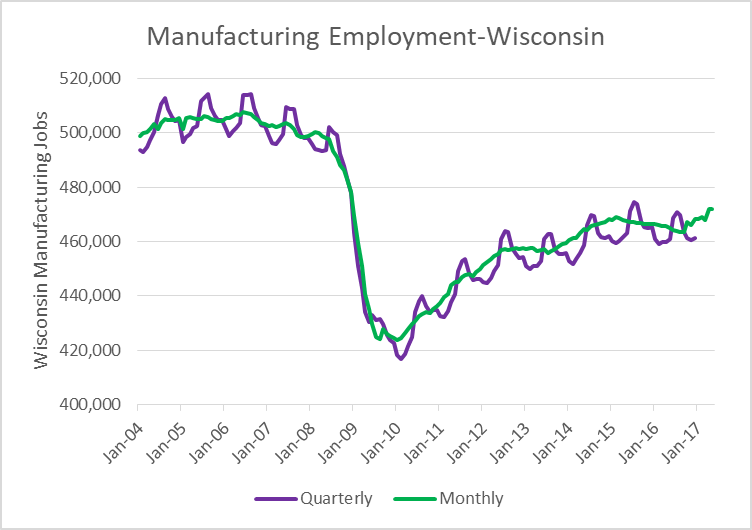 Both these measures show a decline in manufacturing jobs in 2015 and 2016 in Wisconsin. It appears that there may have been something of a recovery in 2017, but we shall see. Is automation the culprit in Wisconsin’s manufacturing job decline? 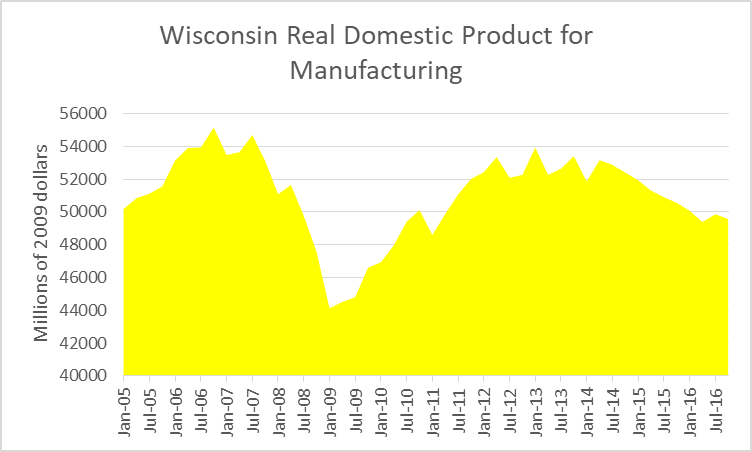 The next graph shows the Wisconsin manufacturing domestic product through the end of 2016. The decline in jobs seems to track a decline in manufacturing output, suggesting that a decline in demand was a major factor here, not automation. Part of the explanation for this decline could be the world-wide decline in the demand for coal. Several major Milwaukee area companies build heavy equipment for coal mining and thus are very dependent on the opening of new coal mines. Increasingly, one hears the argument that manufacturing is constrained by the lack of qualified workers. There are increasing stories about job positions that go unfilled. On the whole economists have been skeptical about the theory that a skills mismatch is a major factor, arguing if there were a true labor shortage worker pay should have increased more than it has. One possible cause for a skilled worker shortage is pay that lags behind other manufacturing states. The next graph is consistent with this theory. 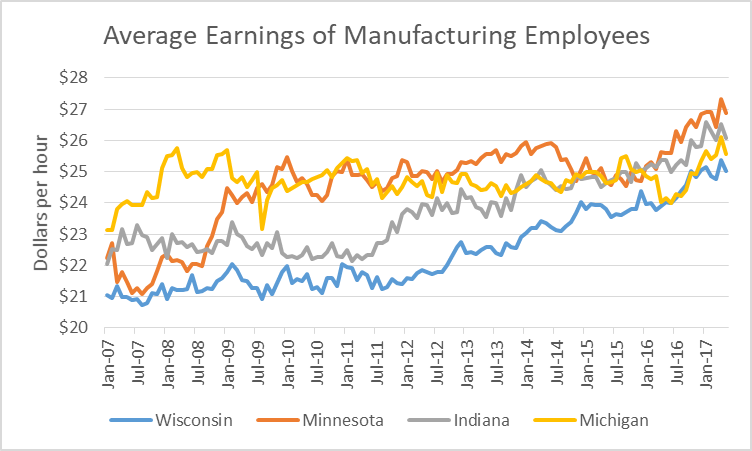 It shows average earnings of manufacturing employees in Wisconsin and three other Midwestern states with a large manufacturing sector since 2007. Wisconsin pay has lagged behind its neighbors for much of this period. Starting in early 2016, pay has risen in all four states as the US moves towards full employment. Also, Wisconsin seems to have narrowed the gap with the other states. It is worth noting that although the chart starts before the Great Recession, it would be hard to identify the recession from the series. This reflects the stickiness of pay in the downward direction. When hard times hit employers are reluctant to cut pay; rather, they cut their workforce. It is noteworthy that Wisconsin’s recent manufacturing decline came as its manufacturing and agriculture tax credit phased in. This simplest explanation is that the tax credit had little effect on manufacturers’ decision-making. If, by contrast, one accepts the argument that the credit had a major positive effect on jobs, the implication is that, without the credit, manufacturing jobs would have suffered a catastrophic decline. That would suggest there is something toxic about Wisconsin when it comes to manufacturing, which seems unlikely and in any event would undermine the idea that the state’s current policies are boosting manufacturing. The same economic theory that suggests that low taxes are a route to prosperity also suggests that low labor costs could attract employers. Both Act 10 and Wisconsin’s right to work law fit into this theory by helping to hold down wages and benefits. 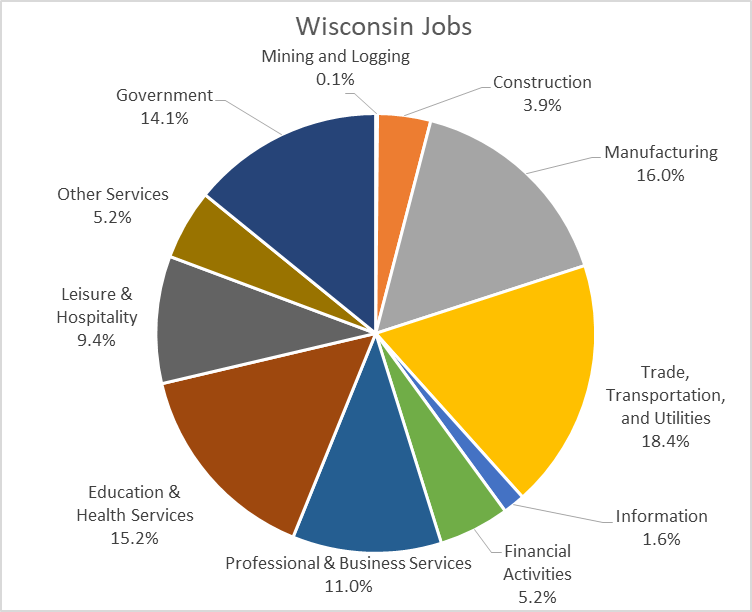 The potential downside to this strategy, particularly as the labor market tightens nationally, is that Wisconsin may be viewed as a less attractive place for those seeking jobs. Is the concern over manufacturing justified? As can be seen in the graph below, it represents about 18 percent of Wisconsin’s domestic product. In the Milwaukee area it is about 14 percent. This is certainly an important segment of the job market, but others are just as important. Why isn’t the same attention devoted to them? For example, why isn’t there the same concern over lost retail jobs? As a recent Atlantic magazine article points out, in the last few months retailers have shed over 100,000 jobs, and the job cuts announcements keep coming. In the 1970s, when Schlitz was riding high, the general counsel discovered that there were more lawyers working in the bottle house than in the legal department. Apparently law students would get jobs in the brewery while working towards their law degrees, only to discover upon graduation that the brewery work had better pay and benefits than working as a lawyer. There is a danger, I think, of letting nostalgia for the past drive economic policy. 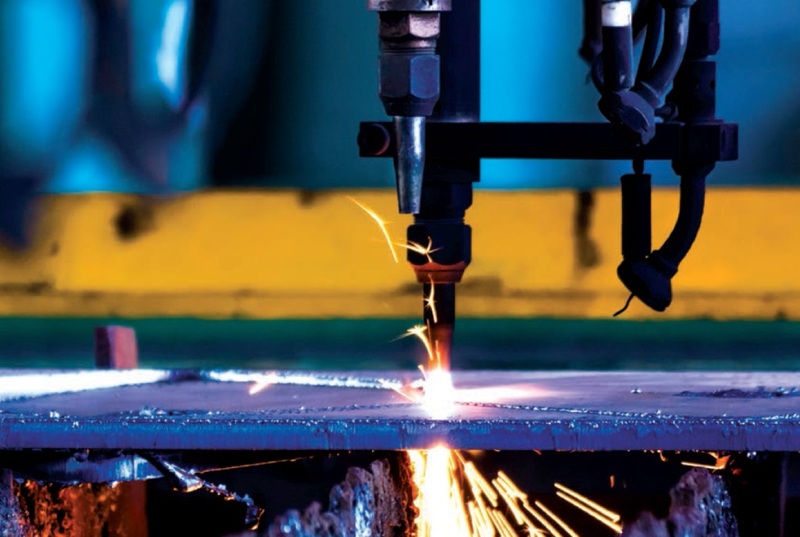 While it is important not to write off manufacturing, it is also a mistake to expect a return of the highly repetitious mass manufacturing jobs. Those jobs are either being automated away or migrating to nations with much lower labor costs. In its fixation on manufacturing jobs, Wisconsin runs the danger of a milder version of the coal obsession in coal producing states, which tries to recapture a past that will never return. This kind of fixation makes it harder to build a new economy and blocks serious planning for what comes next. Bruce, interesting data you bring up here. I vary in my conclusion, but good topic to discuss. One point of contention, when you state “On the whole economists have been skeptical about the theory that a skills mismatch is a major factor, arguing if there were a true labor shortage worker pay should have increased more than it has,” I could only think of reports that fail to take global and regional competition into account, such as that of Dr. Levine. Meanwhile, in my discussions a few years ago with Dr. Chowdhury of Marquette, who is probably far more qualified in the matter, contradicted many of Dr. Levine’s positions. He agrees that there are far more factors that prevent manufacturers from just raising wages to fill jobs. Not to mention raising wages doesn’t magically make people qualified. Even still, if they did raise wages, it would be over an extended time… and if anything, we are seeing that in the chart that demonstrates WI closing the pay gap with MN, IN, and MI. As a side note, I’m very curious how we compare to IL and perhaps other midwest states. Are we lower than them as well? 1. I haven’t looked at the skills mismatch question in detail. Econ 101 would say that the surest indicator of a shortage is prices go up. Until recently, at least that hasn’t happened. Also there was a recent scholarly paper I came across that assumed the skills gap completely disappeared and concluded the effect was minimal. I cannot vouch for the model used but it was regarded as credible. 2. IL has a couple of problems as a comparison to WI. It is much less manufacturing intensive than WI (9.5% of jobs according to the BLS compared to 16%). Also the failure of the legislature and governor to agree on how to pay pension obligations has got to make the state less attractive as a destination. I would have loved too see those data graphs extended another 20 years (at least). For the last 50 years, starting in 1966 the US balance of trade (in goods, excluding services) showed a surplus of $4B in 1966, and deficits of $10B, $145B, $191B, $840B, and $750B in the years 1976, 1986, 1996, 2006, and 2016 respectively. All “data wonking” aside, I have a hard time understanding how this doesn’t have a negative impact on any state economy. (I was also surprised to see that the deficit in goods actually improved by almost $100B from 2006 to 2016. Maybe that helped to hide the damage of corporately managed “free trade” policies in the “data” this article cites). It’s nice that we can currently “have our cake and eat it too” and not actually have to make the consumer goods we purchase, but god forbid if we have some kind of dollar crisis or major war in the future. I’d kind of like to see the data grouped geographically within the State. I have to believe that the northwoods paper manufacturing industry is stagnant at best and likely in decline due to changing technology and market forces. The farther you get from Minneapolis and Chicago I’d think the less attractive it is to build. I imagine for parts of the State, that sector looks very bleak. Getting FoxConn, and a modern electronics plant, would be a big win. There’s growth potential in that.